This article will describe the process for syncing your mobile book and detail the automatic syncing that takes place in Profit Rhino. When ever you make changes to the office version of your Profit Rhino, you'll need to make sure those changes get transferred over into the mobile version. To do so, you'll need to do what's called "Syncing your book". 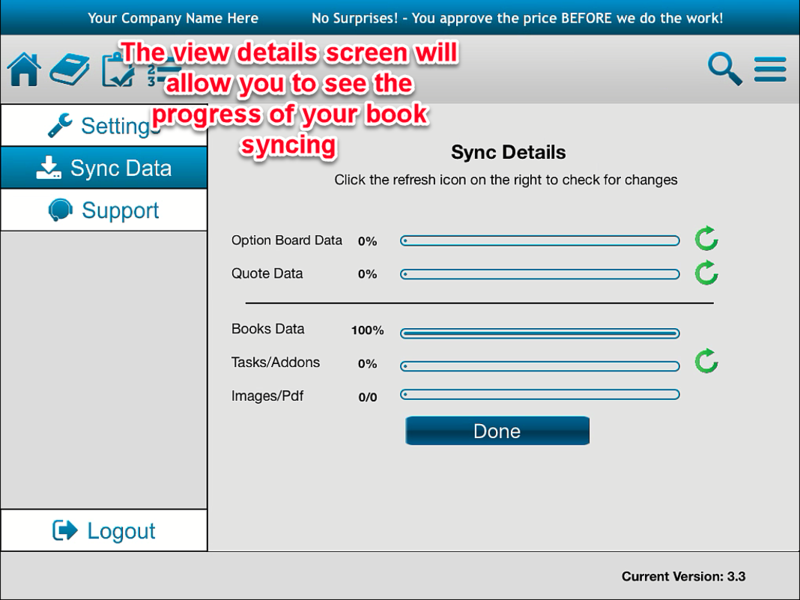 Syncing your book will import all the data from the office version onto the mobile version. In addition to bringing in any changes you may have made to the office version, syncing your book can also be helpful in ironing out any issues your mobile application may be having. Occasionally, you may run into errors were certain tasks aren't showing up, or options boards are missing, or etc. Syncing your book can help remedy these issues without having to call into the support team. 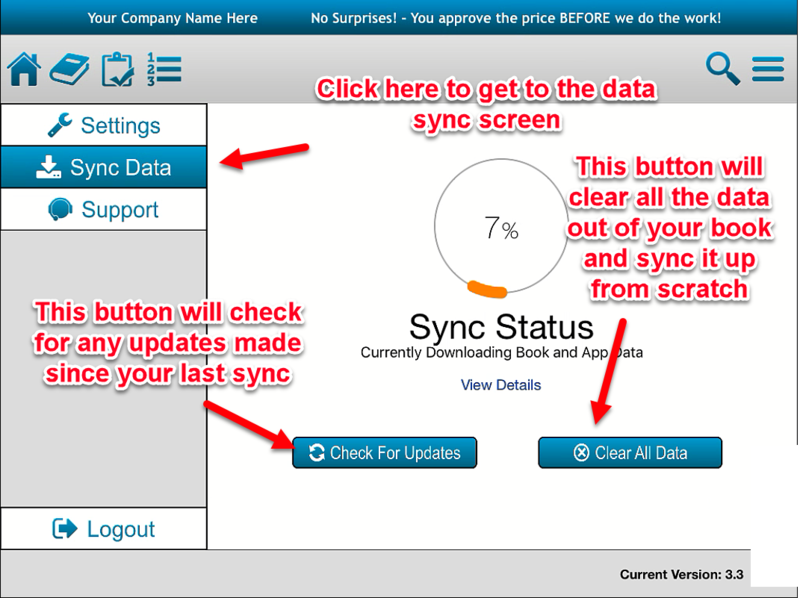 As denoted in the image above, you'll need to click on the tab that says "Sync Data". Once there, you'll have two separate options for syncing your book. [Check for Updates] will check for any changes that have been made to the office version of profit rhino and bring them into the mobile. If, for instance, you've updated a handful of tasks, make sure you click this button on your mobile after doing so. This process is quick and easy because it doesn't take the time to re-download data that hasn't been changed. We refer to his as an "Incremental Sync". [Clear All Data] will clear everything out of your book and import all the data from the office application fresh. This is the one you'll want to use when you're having issues with your book as far as their being missing items and etc. Please keep in mind that syncing after you clear all the data will take a longer amount of time compared to checking for updates. Be prepared to wait for at least a few minutes. This screen will allow you to check, in real time, the syncing process. It will show how far in each part of the book is. This is obviously useful in giving you an estimate for how much longer it'll take. That covers the manual syncing that you'll need to do in Profit Rhino in order to get your mobile and web versions of Profit Rhino to line up, but what about the quotes and option boards you save offline? How do those get synced to the server so you don't lose them later? That's where Profit Rhino's automatic syncing abilities come into play. When you save an option board or a quote offline, Profit Rhino will notify you that your quote or board will not be synced into the database until you come back online. 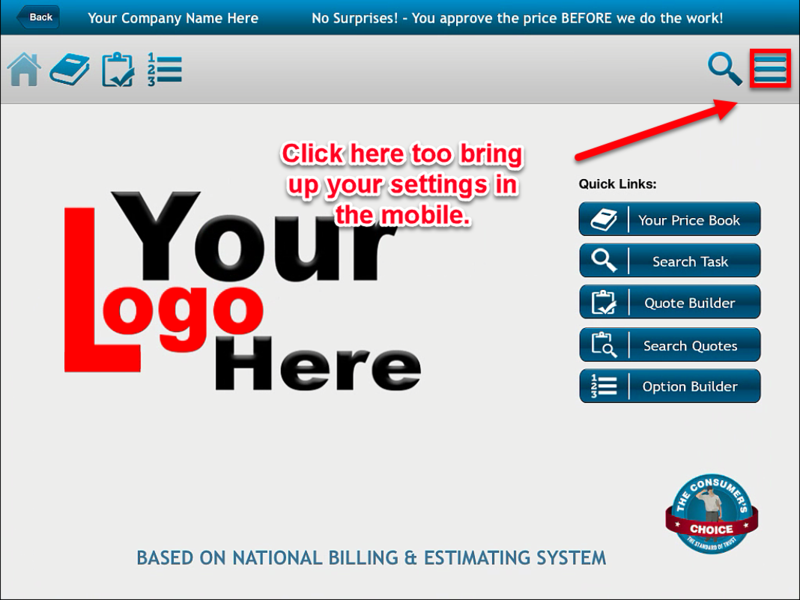 For quotes, that means that you'll only be able to access that quote from the account and pad it was saved on. For option boards, it means the dynamic option boards created out in the field will only be able to be accessed in the account and pad they were created on. Normally, you'd want it so everyone with permission can see all quotes, and that all option boards would appear in your tech board list in the web described here. So, what do you have to do to make sure your quotes and option boards are saved into the database once you regain internet connection? Nothing! Profit Rhino will now automatically sync these quotes and option boards into the data base as soon as you regain internet connection, so you don't have to worry about it. That should cover everything you'll need to know about manual and automatic syncing in Profit Rhino. Good luck!